I always know what I want to be for Halloween for months, this year the idea came to me about a week before when x-men was on tv. 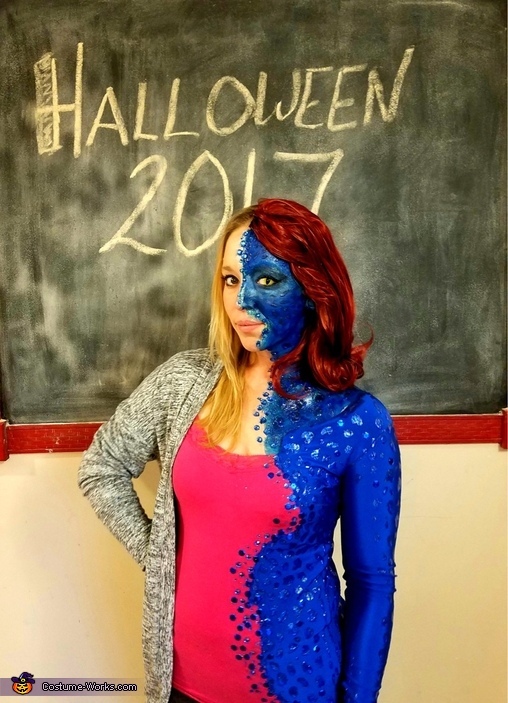 My boyfriend was like “you can be mystique!” And I’m like “there is no way I’m only wearing a body suit in public!”. I sat there and it him me. Why not be mystique turning into her blue self?! I used old clothes I already had and bought a body suit to cut up. I sewed them together and glued rhinestones on. I cut an old wig in half and ordered a yellow contact for the big night. For the make up, I painted my face with blue liquid latex and added detail with eyeshadow and glitter. The whole makeup process took about 45 minutes. This was probably one of my favorite costumes to date.